I recently had the opportunity to visit the 45th Infantry Division Museum in Oklahoma City near NE 36th and Martin Luther King Blvd. This is Oklahoma’s only state operated museum dedicated to military history. And what a history they have! How about seeing Hitler’s personal copy of Mein Kampf. It’s on display in the 45th Museum as it was captured along with many other personal items by the 45th Infantry Division at the end of World War II. You can also see the Bill Mauldin Room. 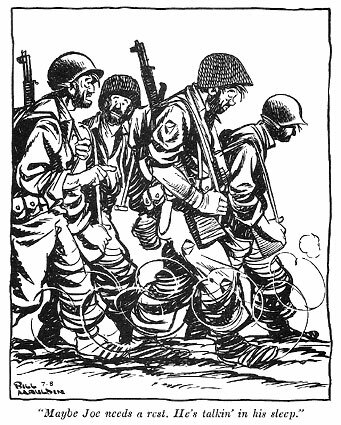 There are over 200 original cartoons created by Mauldin depicting “Willie and Joe” made famous during the war. There’s also a vast display of weapons and uniforms going back to the Spanish Exploration, Civil War, World War I and World War II, Korea, Viet Nam and Gulf War. Admission is free. The museum is closed on Mondays. If you have any interest in military history, it’s well worth a visit.